carriers « What Happened to the Portcullis? With under one month to go until the SOLAS verified gross mass (VGM) regulation enters in force, less than 15% of International Maritime Organization (IMO) Member States have issued guidelines on how they plan to enforce the amendment, according to the International Cargo Handling Co-ordination Association (ICHCA). The amendment, which will enter into force on July 1, 2016, will require shippers to obtain and declare the VGM for each packed container before it can be loaded onto a ship. Despite the efforts of lifting equipment suppliers, carriers and forwarders to engage positively and identify the most appropriate way to comply, Mr Brough said that sadly, where compliance is a shared responsibility, communication between all the different parties has too often been “acrimonious rather than collaborative”. As a result, contingency planning is now crucial for all stakeholders to avoid a potentially disastrous impact on the container supply chain, he added. It was suggested at a recent ICHCA seminar that the key to successful implementation of the VGM requirements is close communication and co-operation between governments and all industry stakeholders. Rod Agona, Managing Director, Electronic Invoicing, INTTRA explains three reasons why it is time for ocean carriers and shippers to say goodbye to paper. This follows the recent announcement by IATA on the introduction of its eAWB initiative. In a digital age where a delay of seconds or one human error can be the cause of lost revenue, wasted resources or unhappy customers, good technology becomes critical to run a business. 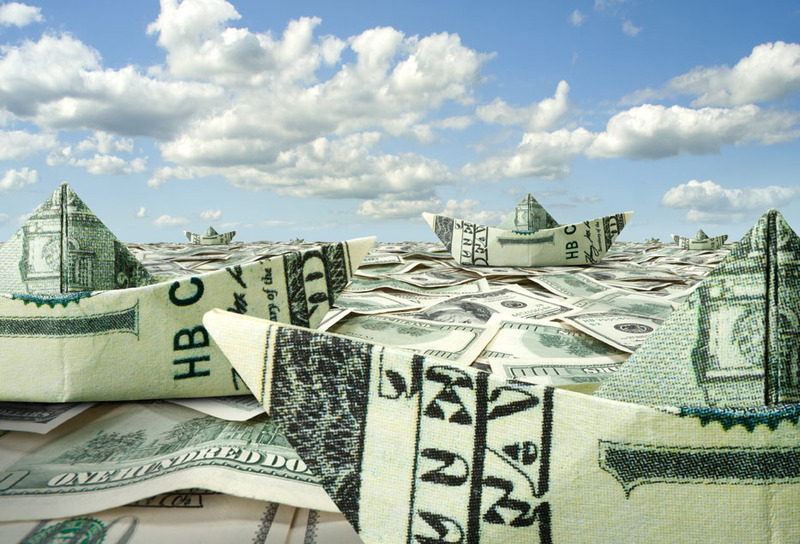 Twelve years after the ocean shipping industry adopted e-commerce tools that resulted in an average savings of $100,000 per year and hundreds of thousands of labor hours per week, the final step in the shipping process – invoicing and payment – are still catching up. Surprisingly, invoices are still largely processed by hand in the ocean shipping sector. Considered the most tedious and costly step in the shipping process, manual invoicing can take days to complete and is often riddled with disputes and errors. And the amount of time it takes to manage disputes is more than anyone is comfortable admitting – knowing each delayed payment impacts carrier cash flow and creates dissatisfied shipping customers. With electronic invoicing (e-Invoicing), there is a potential 50-80 percent cost savings according to the E-Invoicing/E-Billing 2012 Report from the international e-billing firm, Billentis, and the payment process is significantly shortened with DSO (days sales outstanding) typically decreasing by up to 10 days. Error rates are also greatly reduced, and customer satisfaction increased. Shippers’ biggest complaints with paper invoicing are 1) managing disputes, 2) the time and costs required to process invoices, and 3) correcting invoice inaccuracies. e-Invoicing is proven to alleviate these concerns by streamlining the entire settlement process, improving accuracy, and reducing the costs and labor required to process manual invoices. Payers end up happier as a result, receiving faster and improved communications and lowering the true total cost of doing business. 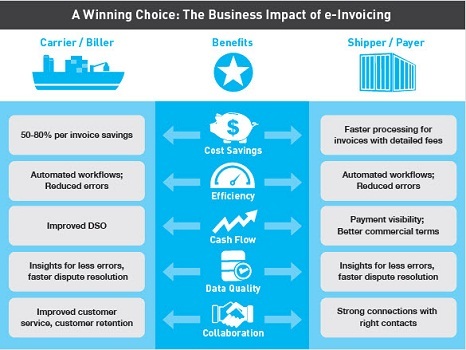 For carriers, e-Invoicing is proven to cut costs and improve cash flow and working capital – and investments are often gained back within six months. Both shippers and carriers want a solution to better manage high-volume transactions. Imagine spending millions of dollars on a global SAP (or equivalent) rollout and still manually keying in a half-million invoices per year. There is a better way. 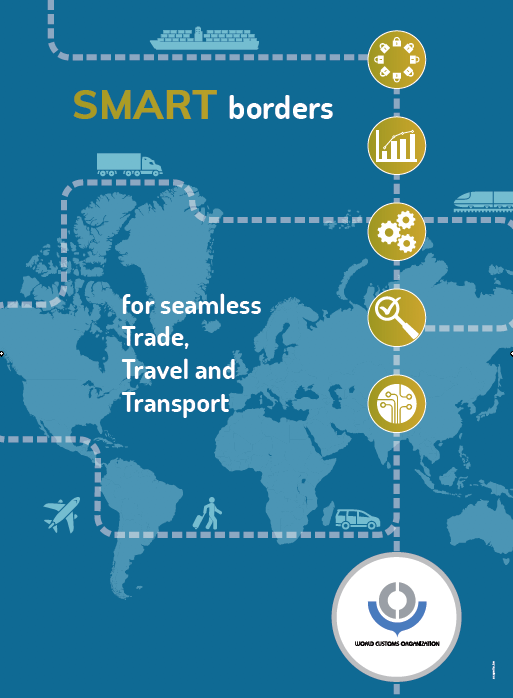 Shipping companies are trying to keep up with rapidly changing local and international trade regulations, and e-commerce shipping is the smart way to stay compliant. Countries like Mexico, Brazil, Norway, Sweden, Finland and Denmark have already made electronic invoicing mandatory for all business-to-government transactions. Most others in Europe, North America and Australia are increasingly adopting electronic invoicing due to its cost-saving benefits. Companies that act today put themselves at a competitive advantage as they are able to put their savings back to work and redirect employees engaged in manual processing to higher value tasks. The tipping point for when a technology ‘best practice’ becomes a ‘must have’ is never clear-cut – until an industry struggles as much as ours has. Change is hard, but for an industry with few proven solutions to remove costs, e-Invoicing is a viable, must-have solution.